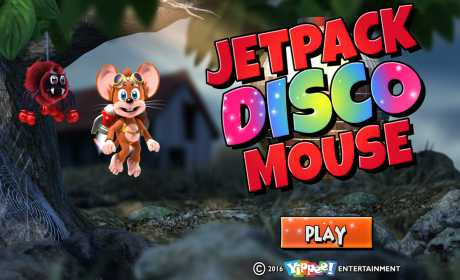 Jetpack Disco Mouse needs your help to create the perfect party for his friends in this simply stunning, quirky side-scrolling adventure. Everyone knows mice can’t fly, but Disco Mouse is fully equipped with a state-of-the-art jetpack capable of blasting through farmyards and woodland as he busts his disco moves. Of course no woodland is without its fair share of creatures and hazards to dodge, so be careful to stay out of trouble or you could lose your groove. Control is easy: tap the screen to provide thrust, or hit boost to dodge obstacles and smash through the scenery. 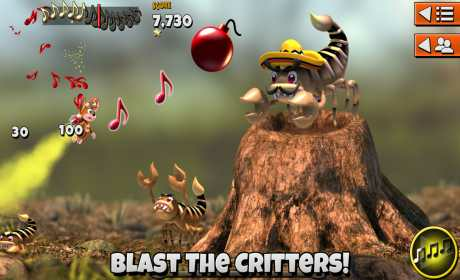 Collect musical notes to perform dance moves and come one step closer to the glittering ‘super boost’. Fill the groove meter to complete the level, or take on special missions to win delicious party snacks which must be flown back to the giant disco ball. That’s no mean feat; even a strawberry can be a weighty struggle when you’re a mouse! – Mice, music, snacks, and a massive disco ball! 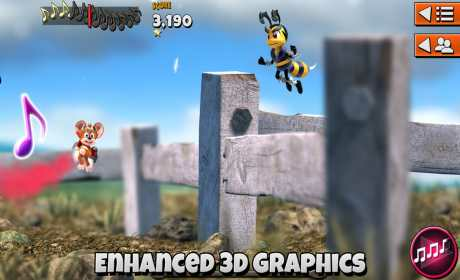 – Enhanced 3D graphics including depth of field and parallax motion. – Hundreds of stunning countryside levels with dramatic lighting and weather. – Fight back with a range of power-ups to deploy. – Connect with Facebook to share high scores and gifts.